This is the country for Malilu. 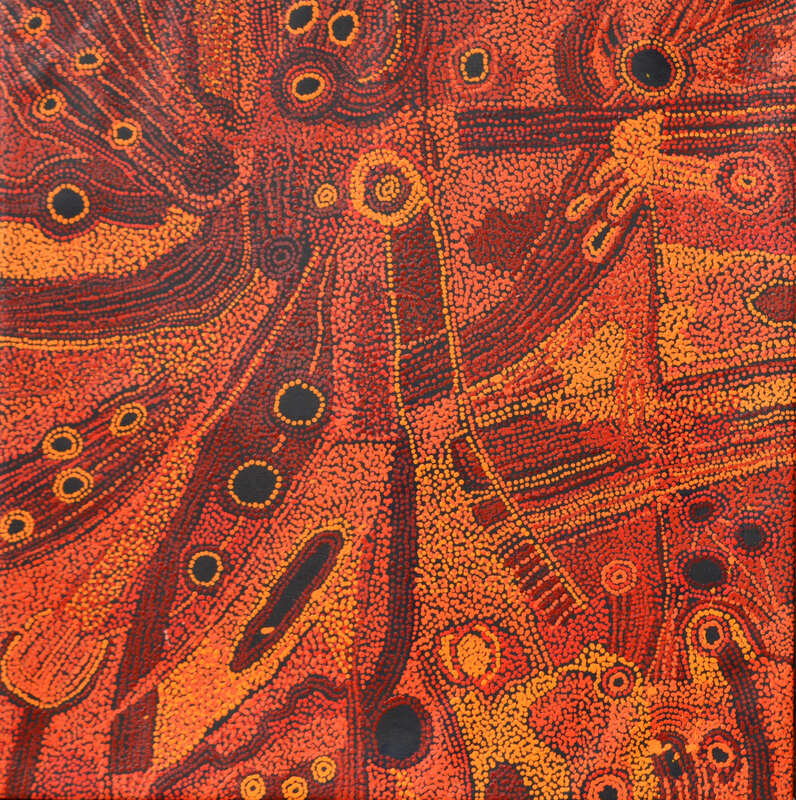 She is a creation being from the Tjukurpa (Dream me). Minyma Malilu nyinanyi wana ngka munu pi (the woman Malilu is sitting with her digging stick and collecting bowl). She has been dancing, performing Inma important ceremonial dancing for this country and she has le her dancing tracks behind in the sand. Malilu was a crippled woman and her two daughters had run off to get married, leaving her to fend for herself. It was very hard for her to collect bush foods and water because she had to drag her leg as she walked. Through much effort she collected kampurarpa, wiriny-wirinypa, tawalpa munu mai kutjupa-kutjupa ( desert raisins, bush tomatoes, berries and many different kinds of wild foods). Malilu dug out a cave in the earth, Katatjitj. It has a small opening, but is a huge underground cave. She would hide her surplus food there for when she was hungry or too red to go out hunting. She would make inma (ceremony) in the cave. This is my country close to Kanpi community.